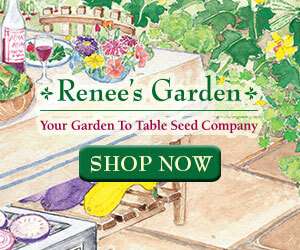 Why Did My Bowls Bust? 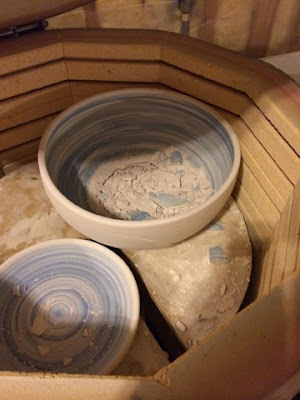 Today I opened the kiln after a bisque firing and saw an exploded 12" bowl. It was a gorgeous piece, and it was disappointing to see it shattered on the top shelf. 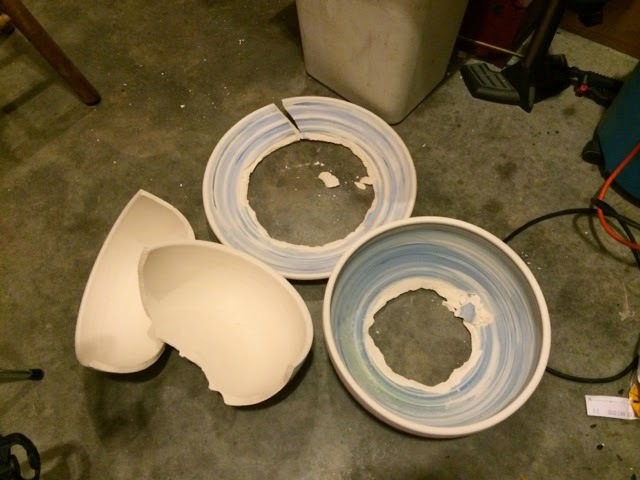 As I unloaded the rest of the kiln, I found the other large bowl and 17" plate also shattered. A few years ago I might have cried at such an infortuitous firing, but I just inspected each piece to try and understand what caused each one's failure. The only thing better than getting a perfect firing is learning important lessons, as painful as those may be. Usually my lesson is PATIENCE -- as in get more of it. I'm assuming the first one needed slower drying and less thickness in the bottom as the rim was fully intact, but the middle was blown out. 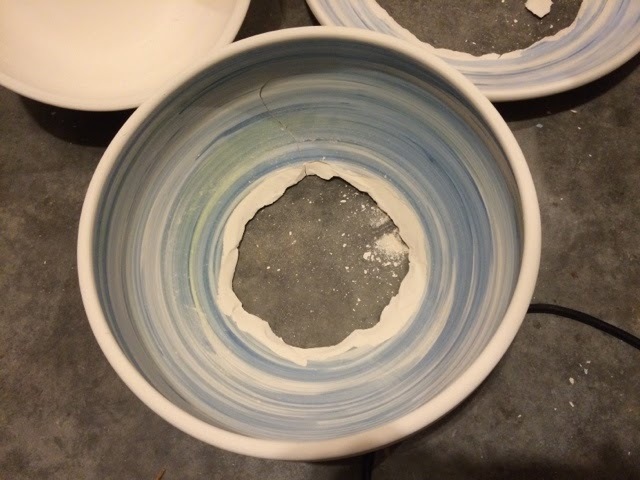 If the bottom still had moisture, it would have pulled away from the rest of the bowl as it continued to shrink during the firing. The second one seemed to have a fold near the foot that trapped air. I'm careful to compress the bottom of my pieces, but I was trying something new. Instead of trimming a foot, I tried to turn over the bowl before leather hard and throw a foot. The obvious problem here is that the rim would have to be dry enough and the base wet enough to still manipulate the clay to form a foot. 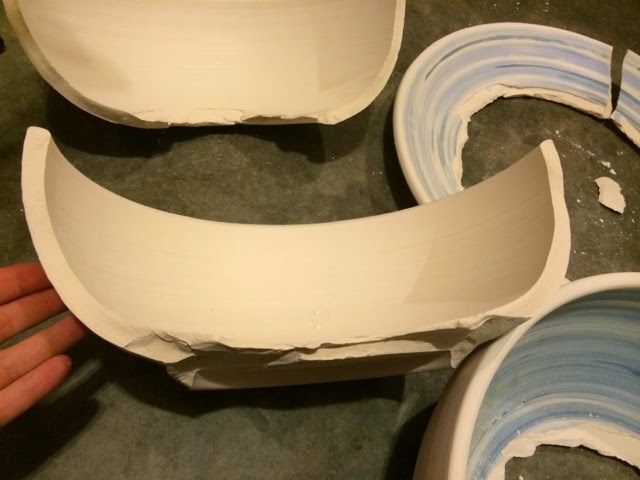 The other problem is that as I pushed clay in from the bottom edge, some must have folded over on itself. You can see the pocket formed two pictures down. 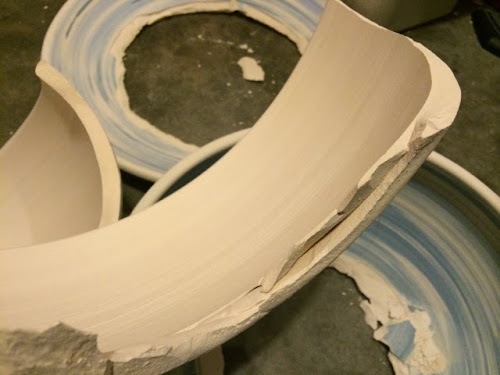 The plate was simply total failure brought on by using already-been-thrown clay. The real shame in that piece is that I spent so much time on it. Isn't that usually the case though? 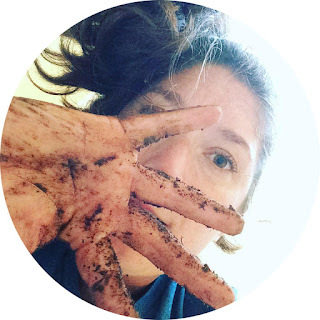 It seems that chances of failure increase with time spent nagging the clay. The rest of the batch has been glazed and reloaded. Losing three large pieces like this cleared a lot of room on the shelves, so fitting it all in was a cinch!